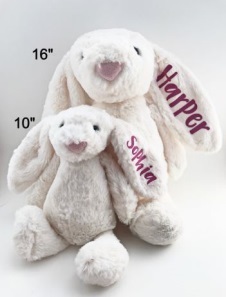 10" and 16" stuffed plush bunnies personalized with a child's name. The products affected are 10" and 16" stuffed plush bunnies personalized with a child's name. The colors of the products sold were pink, blue, cream, brown, and grey. The recalled products may contain phthalate levels that exceed the allowable levels. As of October 11, 2018, the company has received no report of incidents in Canada, and no report of injuries. Approximately 31 units of the affected products were sold in Canada. The product was sold from February 20, 2018 to August 27, 2018 and was sold online via Etsy and Facebook. Consumers are advised to dispose of the product immediately and contact Mom Life Market via email for a full refund.